Mistaken identity ... At the recent Snowman Rally, quite a few folk expressed some confusion over the identity of one Mr J Bunnet Esq. Indeed some actually wondered if Mr B was a pseudonym for someone else! This followed on from an article on this very page a few weeks back where it was revealed that Jaggy Bunnet did legally possess a valid and legitimate Competition Licence as issued by the sport's governing body and actually competed with some of the country's top drivers, including Murray Grierson and Alistair Brearley. Oddly enough, a few folk still remain sceptical. Sadly for those deluded conspiracy theorists, Mr B did actually qualify, apply for and obtain an entirely legal Competition Licence which entitled him to compete on a variety of Scottish events. And yet to this day there are those who refuse to believe that Jaggy and a certain Scottish motor sports journalist are two entirely separate people. Even the national press got it wrong. 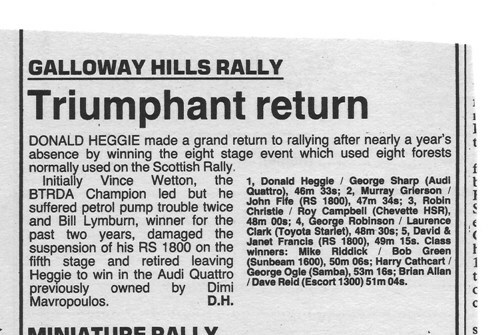 In its post-event report from the 1985 Galloway Hills Rally (see attached), 'Motoring News' compounded this misconception trying to credit said journalist with second overall beside Mad Murr instead of the actual co-driver, the esteemed Mr Bunnet himself. Naturally this occasioned a furious response from the northern prickly one and he was so incensed that he fired off a missive to the deep south (see second attachment). It is further alleged that he actually pasted eight, highly valued and collectable, Green Shield stamps on to his letter to ensure that it reached MN's ivory towers in Londonium, south Englandshire. This was indeed a heinous crime on MN's part. Despite the fact that 'Final Results' had been declared and issued and which accurately recorded those who took part in the event, they chose to 'amend' these official Results and insert a certain journalist's name where in fact it was Mr Bunnet himself who should have been credited with this feat of sporting success. It is a fact of motor sporting life that when results are declared final nothing can be changed except on appeal to the sport's governing body. This is why there is a half hour period of 'Provisional Results' being declared before they go Final. Apart from the usual timing or route queries, this period can be used to correct class qualification, make and marque of car, and the names and spelling of crew members should the original paperwork have got it wrong. Once declared Final, that's it. Like the Commandments etched in stone, Final Results cannot be altered on the whim of a mere southern scribe who doubted the rally organising team's efficiency and accuracy. If in fact an error has crept into the Finals then there it must stay for all eternity, unless subsequently successfully appealed against having forked out the necessary coin to effect such an amendment. 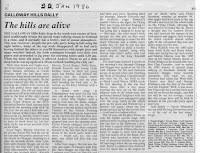 I should add that a much more detailed report (see third clipping, top of 3rd column from left) was then written for MN, submitted and published, but yet again, this thoroughly disreputable scribe did himself no favours in again casting doubt on the identity of Murr's navigator. Despite all that, and still to this day, this self-same journalist is often mistaken for the rogue who still frequents the rallying scene in Scotland. So if you do see either party at any future event just be sure of your facts before opening your gub. Get it wrong and the more genteel of the two will politely set you right, while the other ruffian is more likely to "gie ye a moothfae o' dandruff" if you get it wrong. Note: You may also notice that in JB's letter to 'Motoring News' reference was made to reports which appeared in both of Scotland's major daily newspapers, 'The Glasgow Herald' and 'The Scotsman'. 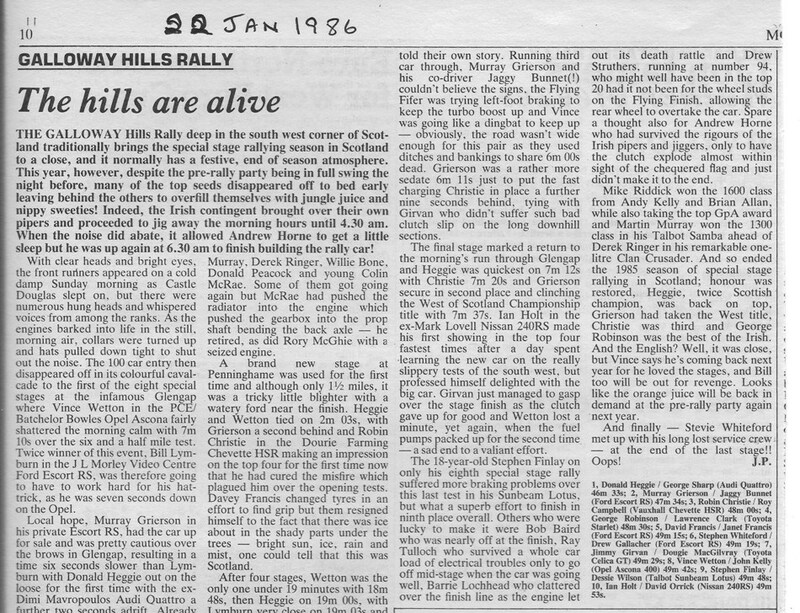 In fact both those papers not only reported on rallies and race meetings, but had a weekly column on motor sporting matters, each Friday. In those days, the 'Aberdeen Press & Journal' also covered the major Scottish rallies. Changed days, eh?